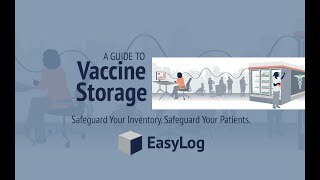 This 21CFR Part 11 compliant, standalone, vaccine monitoring data logger records and displays over 32,000 temperature readings from the supplied high accuracy glycol bottle thermistor probe. The data logger features an LCD and push-button which allow the user to cycle through the most recent, highest and lowest stored readings. Easily set up the logger and view downloaded data by plugging the unit into a PC’s USB port and using the free 21CFR Part 11 software provided. Supplied with a long life ½ AA lithium battery, wall mount clip, glycol bottle thermistor probe and traceable calibration certificate. The EL-21CFR-VAC has been specifically developed to meet the data security required by the FDA's 21CFR part 11 regulations. As such it is suitable for use in applications where the integrity of the data is of the highest importance. The EL-21CFR-VAC comes with a calibration certificate issued at 2 and 8°C.